Combine the elusive symbols of Medusa’s palace but she turns you to stone in this online scratch card game. This is a game based on ancient myth and legend so some familiar faces will arise. Make sure you win the jackpot before you dare to look into the eyes of the serpent queen. NextGen never rest when it comes to coming up with new and innovative experiences for the online casino industry. They experiment with unique themes and graphics that add visual pleasure to games, while giving players the best chances at winning big. The Medusa Scratch game takes you back to the Ancient times, where myths were thought to be true and people feared the stone-turning powers of Medusa. However, you shouldn’t be scared. In this game, Medusa’s eyes bring you big prizes instead! In simpler times, back to the Ancient Romans and Greeks, myths were created to teach people to fear the gods and their power, but also that monsters were real. Medusa was one of them, a Gorgon with snakes for hair, cursed to turn into stone anyone who ever looks into her eyes. She’s not to be messed with, as only a second of carelessness can bring your perish. In this scratch card, however, she is transformed into a rather beautiful woman, whose snakes serve almost as decoration, taking the fear element out of the myth. Therefore, you can fully enjoy your experience while gazing into her emerald eyes without any consequences, besides, of course, winning lots of prizes. In an online scratch cards game like Medusa, the rules might seem quite different from those of the slot games you usually play. The first thing to do is buy a ticket, which is represented by 9 cards that form Medusa’s gorgeous face, complete with the piercing gaze. Then, the only thing left to do is click on each card to reveal the symbol underneath and see what you won. You can click on the cards individually, if you’re a fan of suspense and want to enjoy if for longer. However, if that sounds boring and like it’s taking too much time, you can click on the magic wand button to reveal all symbols at the same time. Scratch cards are some of the easiest ways to win, because all you need is to get 3 symbols of the same kind on one ticket, regardless of their order. The symbols represent elements of the Ancient Roman life, such as coins, golden jewellery or ancient buildings. The prizes range between 1x your bet for the winged shoes, up to an extraordinary 1000x times your bet for the Medusa icon. All of these are helpfully written right next to the ticket, so you won’t have any trouble figuring out how much you could win. The gameplay is very simple and rewarding, while the design is user friendly, so you won’t get lost in all the button and features. The cards are revealed with magical sparkle and sounds, giving the experience an extra touch of charm. Generally, casino scratch card games are better suited for players who like to win quickly and easily, while still having the chance to collect big cash prizes. Medusa has all that, along with a beautiful theme, so go ahead and get lost in her eyes! 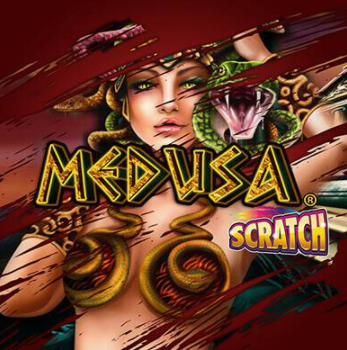 The Medusa scratch cards game enthrals with the beautiful graphics and captivating theme, while keeping it simple when it comes to amassing prizes. At the end of the day, you’ll feel satisfied and you’ll quite possibly be a bit (or a lot) richer.